Devuni Sthuthinchudi, Telugu Keyboard Learning Book. 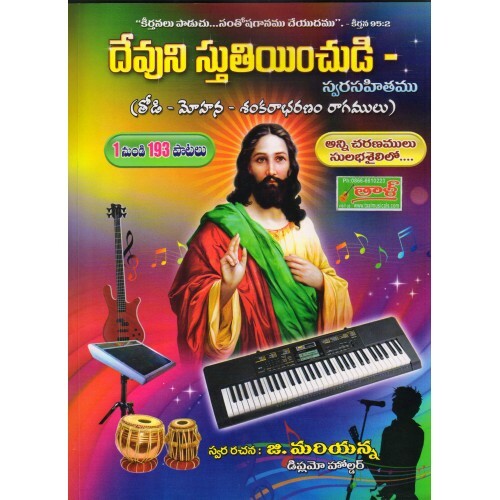 1 to 193 Telugu Christian songs with Telugu Notation. Featuring a rosewood fretboard and beech neck, this 6-string guitar boasts of durability while its ..
Telugu, Christian Songs with Music Notation to Learn and Play Christian Songs On Music ..
Casio Ctk - 3500, Standard Keyboard. 61 keys with Touch Response, 48 Polyphony400 Tones and 100 Rhythms50 Dance Music RhythmsKeyboard61 p..
Key to Keyboard, Music Keyboard Learning Book In Hindi. Key to Keyboard, Music Keyboard Learning Book In Hindi.Key to Keyboard Music Keyboard Learning Book ..